On the subject line, I fill in the day of the week, i.e. “[Thurs]day”, and stick the date in between the two “//”‘s. Same thing with the date in the main body of the e-mail. I’m a fan of plain-text reports myself, because I like the idea that they can be read on a Blackberry, Treo, etc. and retain a semblance of proper formatting and legibility. Yes, fancy reports with tables and stuff look great on a full-size computer, but I prefer to know that everyone can read it the same way. I actually switched to using simple HTML this year, which displays fine on my Treo, so I think it should be acceptable to mobile users. I break up the report into simple categories. Summary is basically what we did today, i.e. “Blocking for “All I Do,” scene I-4 and I-5, choreography for the ballet…” that kind of thing, or if there was a production meeting, Equity meeting, anything else of note (although a production meeting will then get its own separate e-mail outlining everything that was discussed). Tomorrow’s agenda is the span of day, time of the meal break, and on a show like this which publishes a weekly schedule of what’s being worked and breaks down call times, I only go into further detail if it differs from the published schedule. General is just what it says. It might be an actor who dropped out of the show, upcoming conflicts for actors, a problem with the air conditioning in the studio, anything that doesn’t fit in the categories below. One of today’s general notes concerned these lightweight plastic chairs in the downstairs rehearsal studio, which for the second time in as many days have spontaneously had a leg snap off while an actor was sitting in them during a scene. Thankfully neither actor was hurt, but from now on we’ll only be using the folding chairs from the upstairs studio. I put it in the report the first time it happened only because we rent the studio and I wanted to document that the chair was broken during normal use, and not because anyone was standing on it, throwing it, etc. just in case the studio later complained about it. Putting things in the report is like having a receipt for something. If it was in the report on the day it happened, there’s proof that it happened and when, in case a question ever comes up. This leads into another category which comes after General, but hopefully doesn’t have to be used: the Accident Report. Any time somebody gets hurt during the work day, even if it doesn’t require any medical attention, it gets put in the report, just in case. It doesn’t require any more paperwork unless they decide to see a doctor, at which point they need a C-2, but having it in the report on the day it happened allows them to later prove that it was a work-related injury if it becomes a more serious problem at a later date. For instance, my one and only appearance in the accident report at Phantom was when I was on the deck and through a series of unlikely events, was more or less punched in the side of the face through a masking curtain by the actor I was about to page the curtain for. Some combination of my headset and glasses created a small cut on the outside of my right nostril. When I had a moment between cues, I went to the office to check it and get a tissue, and that was the end of it. But imagine, if you will, that the cut became infected, resulting some days or weeks later in the amputation of my nose. No worker’s comp if it wasn’t in the report. Thankfully my nose is just fine, although on the third day the cut started to heal on the edges and the center turned pink, at which point it looked like a zit. I should have been entitled to payment for emotional damages after that. The other categories below (Music, Set, etc.) I should think don’t require explanation. The video category is only included on shows that have a video component of course, of which this happens to be one. I keep the “nothing today” label in there, and type over it when I have something to say. Today I actually had something to say in each category, which is pretty rare. I try to keep a lighthearted tone in the reports without wasting anybody’s time with stuff that’s silly or serves no purpose. A few things I’ve learned in life about reports are to think about whether what you’ve written is going to cause unnecessary panic, or if it will make people try to get involved in things they don’t need to get involved in. If there is time, there are some things that are best left to a private e-mail or phone call to the proper department, and when they have had a chance to come up with a response, then tell everyone else what the situation is and what’s being done. I have learned from talking to producers and general managers that most of them like a lot of detail in reports, even if they have a lot of shows to follow. Especially in cases of running shows where the producer or GM is no longer actively involved at the theatre, the report is their link to what’s going on. The stage manager’s artistic opinions (whether the cast gave a good show, pacing problems, performances of understudies, etc.) are also welcome, because there’s no one else there to make those judgments, and otherwise the artistic staff won’t know when there’s a problem. When I was production coordinator of Bingo, being 1,200 miles away and having only the report to make me feel like I was there, I got firsthand experience in what someone in the office wants to hear from the stage manager. I have also been thanked by the creators of shows for the detailed reports, because it serves as a kind of diary for the creative process — some have told me that they’ve printed all the reports and saved them as a keepsake. 1. Begin the report at the start of the day, even if it’s only to start filling in what scenes/songs you’re working on. 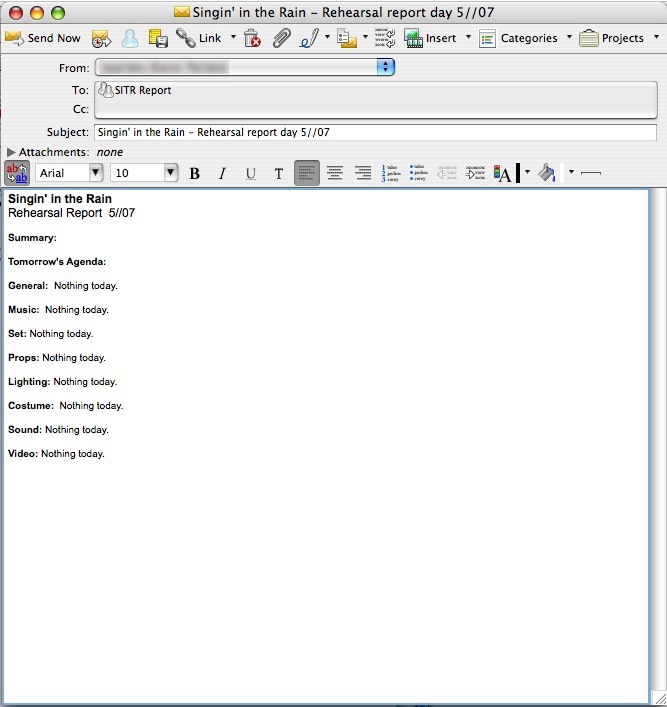 Instead of taking notes throughout the day, type them directly into the report. By the end of the day the report is usually done, but I tend to wait until I get home to send it, just in case something comes up at the last minute. 2. Always finish the report before you start drinking. If you’re going out with the cast and/or crew after a show or rehearsal, take a moment and finish the report before you go. You don’t have to send it, just make sure it’s in sendable condition. It can be really hard to remember what happened that day if you wait until later, not to mention proofread. Then you can go out and relax and not have to put your brain back in work mode when you get home. Thank you, thank you, thank you for your blog entry honoring the rehearsal report. When wrapped up in my own shows I forget that there are other SMs out there going through the same thing I am. “2. 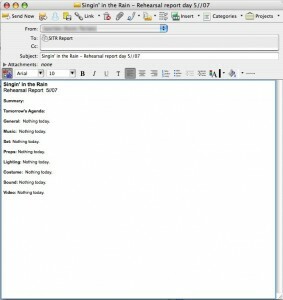 Always finish the report before you start drinking.” This made me roll with laughter. Very sound advice. As a sound designer who doesn’t show up until tech week, rehearsal reports are my lifeline to the production in progress.